Mauro Gnecchi, was born in Lecco 24/06/1953. He starts playing drums at the end of the sixties. In 1972, together with five of his friends, give birth to a rock group “ Un Biglietto per l’Inferno”. After 3 years in concerts, several tour in Italy and abroad, and 2 albums recording, the Group’s end comes in 1976. In 1983 starts approaching Jazz (be-bop). 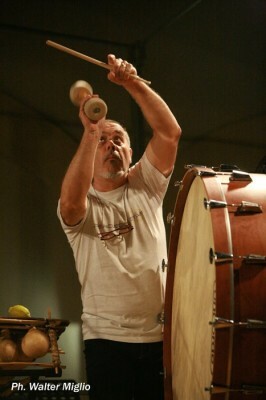 He works as percussion teacher in the CRAMS music school in Lecco. In the same year he meets the big Gunter Sommer from East Germany. One year after, together with Sommer and five percussionists, he’s going to form a new group creating very original sounds. He takes part in different music Improvisation seminars ( France 1989 ), he forms “ BAKAMUTZ Quartet”, with Thierry Madiot trombon ( FR ) , Bert Wrede guitars ( GER ) and Theo Nabicht saxophones ( GER ) and gives new performances in the European jazz world, also during French and German festivals. In 1995 the quartet records the only one Cd “ Bakamutz” with Deux Z. In 1991 joins “ BANDALPINA”, a folk music group. Thanks to a great and interesting research Walter Biella ethnomusicologist, he presents a series of music and dances of the century beginning. In the meanwhile, he cooperates with a Group from Bergamo “ MAGAM”, always delaing with folk music. 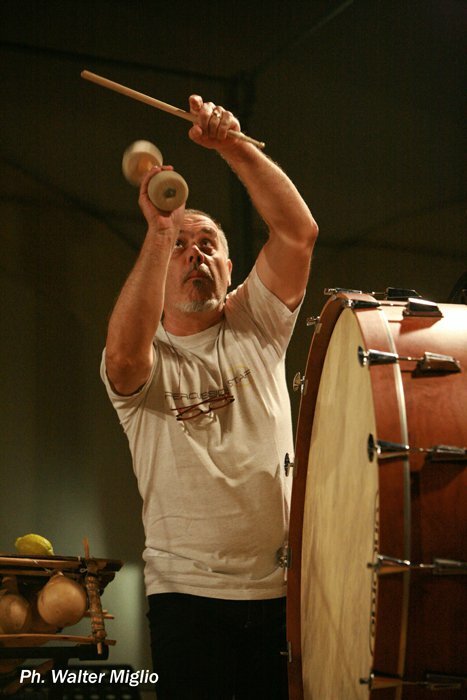 During the month of September, same year, he works as percussionist at his job as soloist with Franco Mussida ( P.F.M. ).